Paddlesurf also known as SUP (Stand Up Paddle) is a new sport, which, for those passionate about the sea, offers a great water based alternative for no wind days with or without waves. 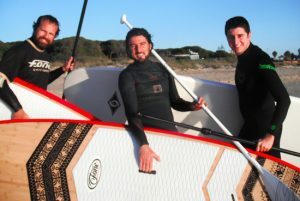 The sport consists of a paddle and and very floaty surf board. Once you’ve learned how to stand up comfortably the fun begins. Exploring the coastline, getting fit and catching waves are all possible in just a few hours. For those that have a little experience we also offer various excursions around the surrounding coastline, navigating around the island of Tarifa, up the Río Jara or down the coast from Punta Paloma to Bolonia, visiting the spectacular beaches along the way with the unique perspective offered from the sea. It is a sport for all ages and activity levels all you need is a desire to enjoy and explore! How to synchronise your movements for maximum efficiency. Introduction to positioning on the wave.